Find out everything you need to know on the new Kia Rio from independent vehicle review website Car And Driving. You can watch the video review to the left to see more of the car or read their written review below to get a true insight from an expert in the automotive industry. 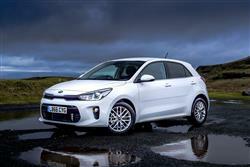 The Kia Rio supermini has been rejuvenated in fourth generation form. Jonathan Crouch takes a look. For buyers, the supermini category has never been more important. Why? Because modern examples of the breed are now for the first time large enough to function as complete family cars. Take, for example, the model we're looking at here, Kia's fourth generation Rio. It's as big as a turn of the century Astra or Focus from the Family Hatchback segment, the next pricier class up. More importantly, it's the first really top class supermini the Korean brand has ever bought us. It's a progression that anyone familiar with Kia will have been expecting. The first two generations of Rio were quite embarrassing but the MK3 model of 2011 was pretty class-competitive. When the wraps came off this fourth generation version in the autumn of 2016 though, it was clear that it was going to be a bit more than that. Here's a car that targets nothing less than the top of the segment in terms of the things that really matter to supermini buyers - styling, running costs and everyday practicality. How close it gets is what we're here to find out. Kia is well aware that driving dynamics weren't a strong selling point of the previous third generation Rio, hence the efforts put in to making this MK4 model more agile and interesting to drive. The stiffer bodyshell should help here and it also allowed the development team to introduce a more compliant suspension system. This Rio benefits from a revised spring and damper set-up than the old model, improving the car's compliance and comfort at all speeds, while supposedly facilitating more enjoyable, engaging handling characteristics. A repositioned power steering gearbox should provide greater feel through the helm too. The previous generation Rio model didn't advance existing engine technology too much, so it's good to see that Kia has made a bit more effort on this front this time round. Key to the line-up is the down-sized three cylinder 1.0-litre T-GDI petrol unit we first saw on the facelifted MK2 model cee'd family hatch, offered here - as there - with either 99 or 118bhp power outputs, in both cases accompanied by 172Nm of torque. The lightweight nature of this T-GDI powerplant should benefit the Rio's front-end handling, with less mass and inertia for the car to work against under cornering. Less sophisticated are the 83bhp 1.25 and 98bhp 1.4-litre MPI petrol units, a comment also applicable to the 1.4-litre diesel engine, which produces 89bhp. All engines apply power to the front wheels. There's a five-speed manual transmission for the base 1.25-litre petrol unit and the 99bhp 1.0-litre T-GDI powerplant. Otherwise, your Rio will come with a six-speed manual 'box. There's a 4-speed auto option on the petrol 1.4. This fourth generation Rio certainly looks more distinctive, the front end characterised by the latest evolution of Kia's 'tiger-nose' grille, now thinner in height and wider across the front of the car, with a gloss black grille cover. The grille is integrated with the newly-designed bi-function headlights, more sculpted for a sharper look, and featuring a new U-shaped LED daytime running light signature. In profile, the lengthened, more balanced stance is achieved with a long bonnet and longer front overhang, a 10mm longer wheelbase (up to 2,580mm), a thinner, more upright C-pillar, and a shorter rear overhang. Overall, the new car is 15mm longer than its predecessor, at 4,065mm in length, and 5mm lower (now 1,450mm tall). Inside, the restyled cabin feels more up-market, helped by gloss black trim that lines the central section of a dashboard now more angled towards the driver. At the centre of the fascia is a high-resolution touchscreen. Below, the driver-oriented centre console features fewer buttons, with more ergonomic, concave switches and rotator dials below to control the heating and ventilation. Thanks to 10mm of extra wheelbase, there's much more space to spread out inside - and more bootspace too, 325-litres of luggage room now on offer, about the same as you get in a Focus, despite the fact that this is a Fiesta-segment model. Rio pricing hasn't changed too much, so as before, this car sits in the £12,000 to £18,000 bracket. That might sound a lot but most variants will be sold in the £14,000 to £16,000 bracket, which makes this one of the more affordable Fiesta-sized superminis out there. As before, the sales focus for the UK will be on the five-door bodystyle. The line-up here is mainly based around '1', '2' and '3' trim levels. There's also a top 'First Edition' option for buyerrs wanting the pokier 118bhp version of the 1.0 T-GDi petrol unit. As before, equipment levels are strong. More affordable models get a 'floating' 5.0-inch touchscreen audio system with six speakers. Buyers can also specify a 7.0-inch touchscreen infotainment and navigation system, with Kia Connected Services powered by TomTom, as well as Android Auto and Apple CarPlay for full smartphone integration. This Rio will be the first car in the B-segment to be equipped with USB ports in both the front and rear of the cabin, enabling users to physically connect a mobile device to the infotainment system and recharge batteries on the move. As for safety, the Rio will be the first car in the B-segment to feature 'AEB' 'Autonomous Emergency Braking with pedestrian recognition' as standard. The Rio's AEB system uses a long-range radar detection system to detect potential collisions with other vehicles or pedestrians and helps bring the car to a halt. AEB is paired with a Lane Departure Warning System (LDWS), which alerts the driver if they stray out of their lane on the road without the use of indicators. The 1.0 T-GDI petrol engines should certainly prove to be very frugal. The 99bhp version manages 62.8mpg on the combined cycle and 102g/km of CO2, while the 118bhp version of this unit manages 60.1mpg and 107g/km. The 1.4 CRDi diesel manages 74.3mpg and 98g/km. All variants get an Idle Stop & Go (ISG) system that cuts the engine when you don't need it, stuck at the lights or waiting in traffic. As with all Kias, the Rio is covered by a seven-year, 100,000-mile warranty that's longer than any other car in the same class. Servicing should be affordable and the various pre-paid servicing packages you can buy will further help manage costs in this regard, with 'Care-3' or 'Care-3 Plus' packages offering retail customers fixed-cost, inflation-proof servicing for either three or five years. Should you sell the car in this period, the remaining scheduled maintenance allocation can be passed on to the next owner. It's easy to see why Kia is one of the fastest growing car makers in the world, doubling its global sales over the last few years thanks to a range of models now seriously troubling the European market's established players. Here's another one that'll add to their concerns, smartly styled and class-leadingly spacious and efficient. As a result, it can now compete head-on with its mainstream rivals and betters many of them. This then, is a car that has come of age. No longer is it a supermini you'd recommend largely because of generous equipment or a modest asking price. True, it still isn't the sharpest handling car in its class and there are a few rivals with classier cabins. None though, are more practical or more refined and few have a nicer ride - another of the reasons why this could be considered a smart alternative to a larger Focus-class family hatchback. If you're thinking of buying in this segment, then you probably won't be considering this car as an option. But take it from us, you probably should be.